Don’t get me wrong, the color of furniture can also affect one’s mood. Try to keep the color of the closet not too striking. Choose calm and neutral colors such as brown, white or cream so that the residents are not bothered to rest. But in order not to look monotonous, you can add cute and beautiful carvings or wallpapers to the closet wall. Some say that women’s wardrobes are usually bigger than men’s closets. This is caused by the amount of equipment and clothing that is owned by a woman. If you want to buy a closet, make sure the size of the closet is in accordance with your needs. Do not let the cupboard be too small or too large so that it takes up space and makes the room feel crowded. 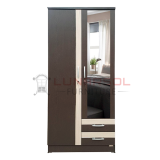 This LPT 029 model wardrobe from Lunar Furniture will be perfect for you. With its modern design it can make your room more dynamic and energetic. This wardrobe will be durable because it is made of good quality material like in general wardrobe from Lunar Furniture. Call immediately 021 54376 555/333 or click www.lunarfurniture.com to get it.